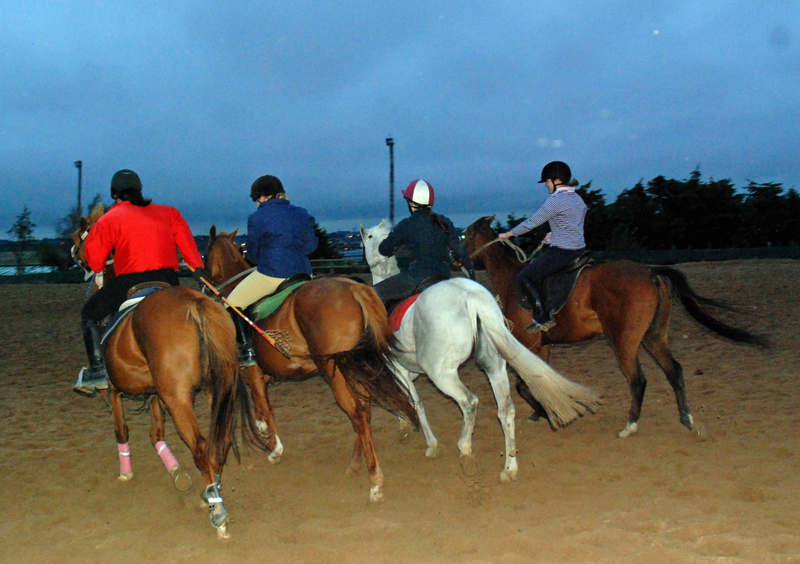 Seven of us arrived at the equestrian centre and went inside to meet our steeds. Mine was a little grey mare called Fern. We headed up to an enormous arena where our instructor Dara gave us some points and some information on polocrosse. Now in life I am not exactly a planner, I get bored easily and I like to get stuck in so I was hoping we would get a chance to do just that without too much theory beforehand. I was seriously not disappointed. Six of us started off and we were divided into three areas – scorer, midfielder and defender. I played basketball as a kid and to be honest I’ve always had a mental block about positions and roles when playing team sports – as the shortest kid of the bunch I kind of used to just run up and down the basketball court after whoever had the ball while pretending to know what was going on. A friend and I being just a little bit competitive! I’m not going to lie this may have been a little similar but it was a lot more fun. Gallop on, find the ball, whack the racket of the person who has the ball, see the ball fall, shove the person nearest the ball out of the way, try to scoop up the ball, gallop more, try to score a goal. Normally there are three phrases when it comes to horse riding that I hear so often that I swear they will be etched on my tombstone – “Lorna you are going too fast”, “Lorna get balanced”, “Lorna sit up straight”. It was a fantastic break from the norm to be going hell for leather with the reins in one hand while attacking with a racket and roaring at people while hearing none of these phrases! The horses were brilliant all I had to do was press the rein to ferns neck to get her to turn for me (quite a change to being on the giant orange train who almost needs a sat nav for a sharp turn!) and my prior outings at Trec proved to be a strength as I am quite happy riding with one hand on the reins. I was also amazed at how close to each other the horses got without arguing. I often used to wonder why polo and polocrosse only played in six minute chukkas. I no longer wonder this. I had completely underestimated how fast paced and energetic the game is – a few minutes in we were breathing heavily and hoarse from cheering and shouting and were glad of the break after the six minutes. I had also wondered what the panels at the front of the saddles were for and soon realised that they are for preventing you from going arse over head when leaning over to get the ball – personally I think all saddles should have these! Now admittedly some of us may have been a little bit competitive in the style of Monica from friends but sure there is no sense in doing things by half is there? One slightly competitive friend (you know who you are!) and I seemed to spend a lot of time battling for the ball and chasing each other around the pitch. The ball was incredibly hard to pick up. Having ridden my little grey pony into the equestrian equivalent of a rugby scrum and found the ball I was useless at actually putting it into the net and ended up roaring ‘get into your home’ Happy Gilmore style at it in frustration. I scored my first goal a while into our second chukka but was advised that it was actually completely illegal as I hadn’t really grasped any of the rules about throwing the ball over the line or about who is allowed to be in each section of the pitch – oops. My second goal was also a little bit on the sopranos side of legal. My teammate and I had, rather cleverly we thought, passed the ball to each other by pressing our rackets together and tipping it in which was again actually totally against the rules but I did think bonus points for managing to do this at canter were in order! I did finally manage to score a goal without breaking half the rules – I galloped down the pitch, threw my ball over the line, managed to shove it back into my racket and into the goal! 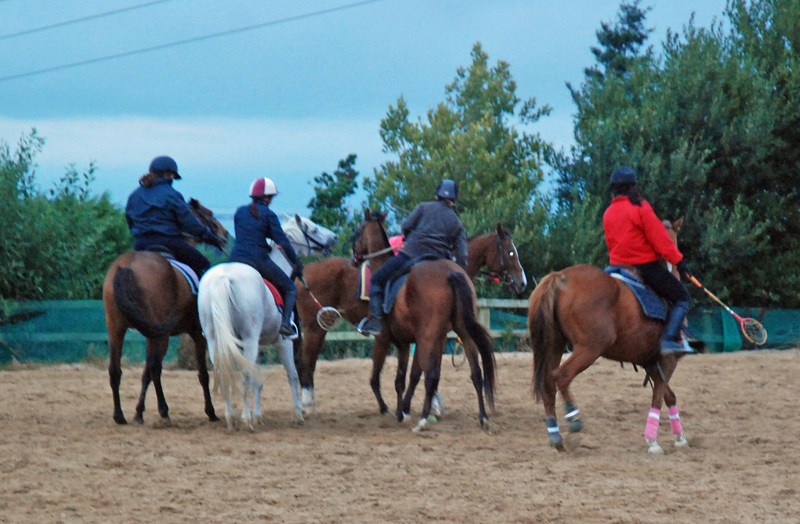 The equestrian equivilent of a rugby scrum! Time was up and light was fading soon after that and it was time for our adventure to draw to a close. Before heading in I did have the privilege of satisfying my chestnut mare penchant by sitting up the lovely Ritz. We headed off around the pitch and I learned how effective neck reining can be – one touch of the rein and this mare flew to the side. As Vivian in ‘Pretty Woman’ would say – she cornered like she was on rails! I think we will definitely be back as I feel we all have another game in us to play and I enjoyed myself entirely. 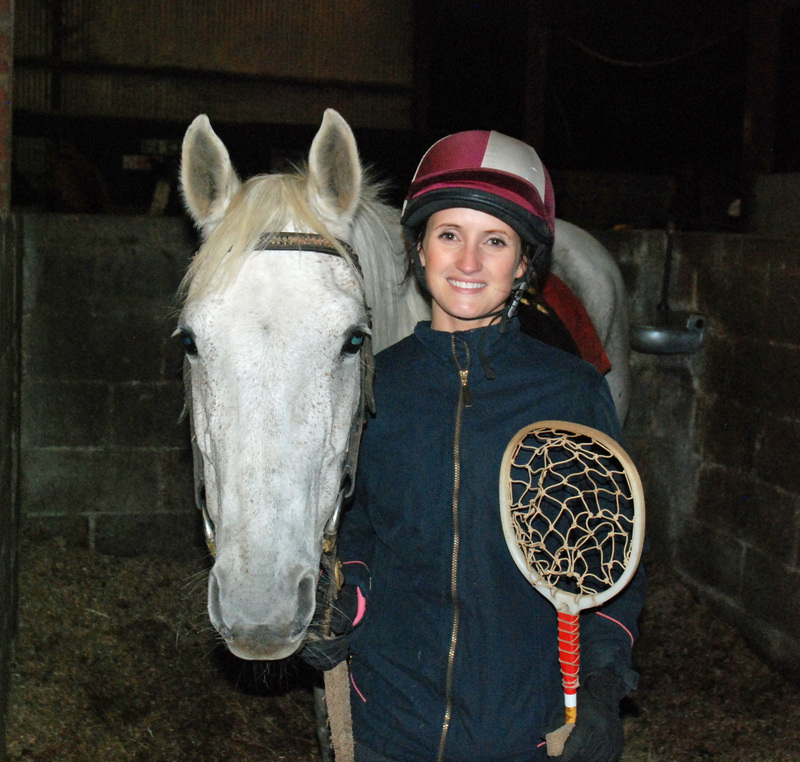 If you are thinking of trying out Polocrosse, check out http://www.ceq.ie , it is a very worthwhile experience. 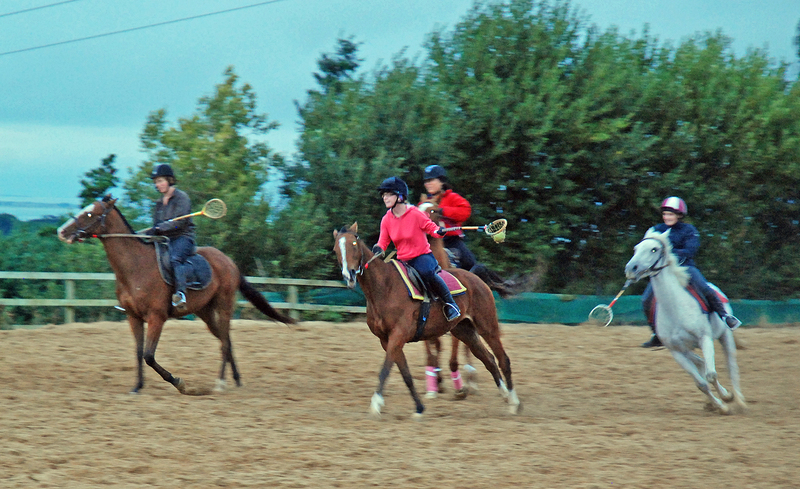 Posted on September 12, 2013, in General, Polocrosse and tagged basketball, Carrickmines equestrian centre, chukka, competitive, equestrian, equestrianism, gallopping, happy Gilmore, Horse, horse riding, horse riding adventure, ireland, irish, Monica from friends, neck reining, neck reining a horse, polo, Polocrosse, polocrosse in Ireland. 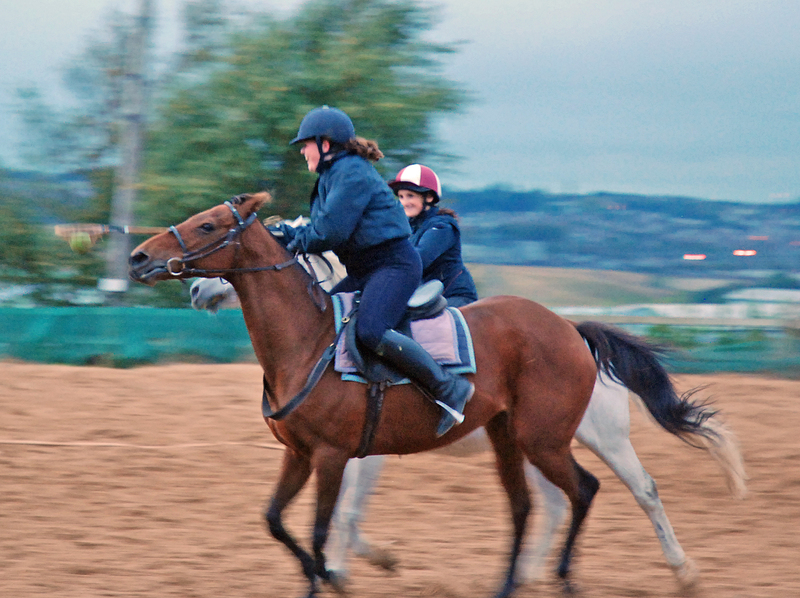 Carrickmines, pony, pretty woman, racket, ritz, rugby, rules, sopranos, speed, team, team sport, teammate, training. Bookmark the permalink. 4 Comments. You have the best adventures! Thanks this was very good fun! You have a good few yourself too – loved the one hacking through the woods and in teeh water that looked amazing! it was i’d definately recommend it!